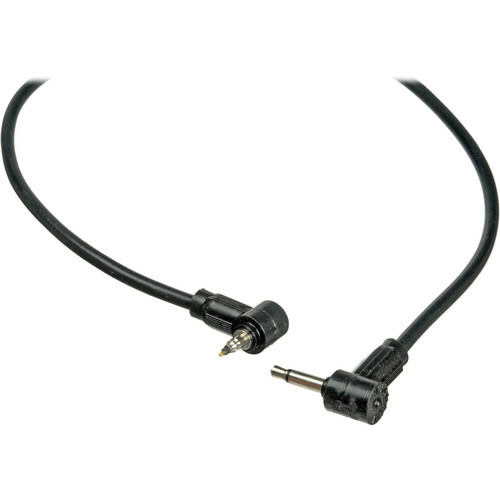 Paramount PW-MV1 Sync Cord - Miniphone to Vivitar - Straight - 16"
The Paramount PW-MV1 Sync Cord is a 16" long straight sync cord that features a Miniphone plug at one end, and a single pin Vivtar proprietory pin connection at the other end. Ideal for linking of a Vivtar flash to a Pocket Wizard Radio Slave. Straight cords are lighter, and usually more economical than coiled cords; coiled cords stretch when necessary, and are more heavy duty than straight cords. Box Dimensions (LxWxH) 11.0 x 5.0 x 1.0"
PW-MV1 Sync Cord - Miniphone to Vivitar is rated 4.9 out of 5 by 7. Rated 5 out of 5 by Idopics from Essential for using vintage Vivitar flashes w digital cams I delight in continuing to use my vintage flash equipment---Speedotrons, Normans, Vivitars---with my digital cameras. With radio triggers between the powerful flashes and the sensitive electronics of the digital cameras the sky is the limit! BUT of course, you need the right cords. The Pocket Wizard cords also work with the Phottix Ares (no longer made but you can still find) and possibly other radio triggers. You just need to get the end that will match your flash. (Other end goes into the trigger (duh). This cord keeps my little Vivitar 283 and 285 speedlites in my lineup. Rated 5 out of 5 by Norman from Save money by buying this cord This item is identical to the one with the official PocketWizard name on the packaging. I have ordered both this one and the PocketWizard branded one. The PocketWizard one comes in a PocketWizard package, but if you look carefully at the actual cord, it is labeled Paramount. Pocket Wizard must just buy them from Paramount and resell them. B&H has them listed as being different lengths on their website, but both are actually 18 inches long. Either way, this is a good, solidly made cord that I have used heavily for connecting my PocketWizards with my Vivitar 285s. Rated 4 out of 5 by Noflash from Old Flash has another life My old Vivatar flash can now be used with my new Cactus remote flash trigger. The cable has a fairly nice length. good end connectors, solid connection. Couldn't find anything wrong with the cable. Great deal !! Rated 5 out of 5 by Car Photographer from Very handy device. Ordered one for each. This is a very usefull item when shooting with flash off camera and with pocket wizard. I am able to locate flash in various locations and control each one independently. Rated 5 out of 5 by CVDM from Right on Point! I plugged em up and started shooting. The cables worked perfectly with my PWIIs. Rated 5 out of 5 by Gary from It works. No issues, it just works.